Fr. Albert O'Brien, O.F.M., was one of the true founders of Friedsam Memorial Library. It was his suggestion that a Jewish foundation was more likely to grant money for a library than a Catholic seminary that set the ball rolling for Fr. Thomas Plassmann, O.F.M., to make that request. Fr. Albert's supposition turned out to be correct and the new library was on course for construction. Fr. Albert was born Sept. 2, 1889. He entered the Franciscan Order at Paterson, N.J. in 1910, made his solemn profession in 1914 and was ordained in 1917. From then until his untimely death most of his time was spent at St. Bonaventure's College and Seminary. He also spent his summers in Albuquerque, New Mexico as the president of the Extension St. Francis College. 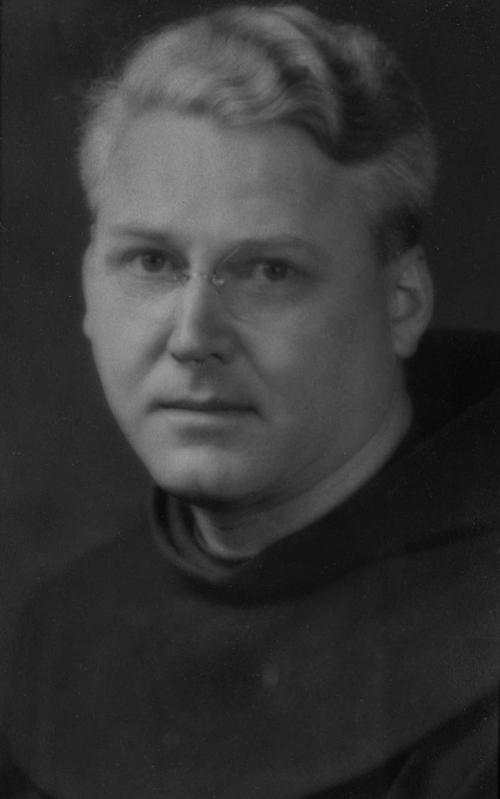 His duties at St. Bonaventure over the years included Prefect of the Seminary, Prefect of Discipline for the College, Dean of Philosophy and Religion and College Librarian. It was while performing his duties as President of the Summer College that he suffered the accident that led to his death on July 12, 1937. The cornerstone of the new library was laid the day of Fr. Albert's funeral, a fitting memorial to a man who had played a major role in Catholic libraries for his entire career. He was a member of the Catholic Library Association from its founding in 1921 and elected its president in 1937. He was an indexer for the Catholic Periodicals Index from its first issue. His role was described in The Catholic Library World: "Father O'Brien has been an active member of the Association since its inception. No one has been more interested in its development , and no one more willing to assist in that development. He brings to the office of President: sound judgment and business acumen--qualities born of many years' experience." At St. Bonaventure, Fr. Albert helped to bring the library into conformity with modern library practices. He introduced the Dewey Decimal System and created a card catalog. He also brought his love of native American art to the campus, giving the library a feel of the Southwest where he spent so much of his time. An alumni of the period commenting about Fr. Albert's library, still located in Alumni Hall, said, "It is no longer only a house of books, but a fascinating place of mental and aesthetic stimulation, one of the most popular spots on campus." A description of Friedsam Memorial Library as envisioned by Fr. Albert O'Brien. A word picture. One of Fr. Albert's last letters to Fr. Irenaeus. He describes his pleasure that the building has begun, his trip to New Mexico and his anticipation of the move into the new building.